Words cannot express how much Chad and I appreciate your support while he battles colon cancer. The visits during his hospital stays, cards, prayers, and encouraging words mean the world to him. Chad was so moved to see the number of Wayne Brothers employees that ran/walked, and donated to the 2017 Get Your Rear in Gear 5K. Thanks again! Continue to keep Chad in your prayers as we search for a cure. As you know, West Virginia has suffered a tragedy over the past several days with extensive and life threatening flooding. We have many members of the Wayne Brothers family who have friends and family in the area and we would like to come together to help them out during this time. John Ashworth and his wife will be visiting the affected areas this weekend, and we would like to ask everyone to pull together a few things and place them in the collection container in the HQ lobby. 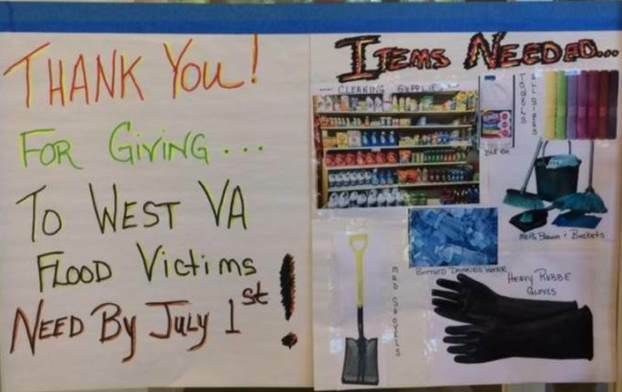 The list of items most needed include: Bleach, Mud Shovels, Towels of all sizes, Heavy Rubber gloves and boots, Mops, Brooms, Buckets, Water, Scrub Brushes, Any and all cleaning supplies. Thanks to everyone in advance! Thanks to everyone for your generous contributions to help the Lowcountry Orphan Relief of South Carolina! It really is all about nurturing relationships and giving to those less fortunate. Thank you to everyone who helped with OPERATION TOY DRIVE and OPERATION GIVING QUILT Wayne Brothers, Inc. partnered with OPERATION HOMEFRONT to support our Veterans and their Families this holiday season in two separate ways. The first one, OPERATION TOY DRIVE, is dedicated to brightening the holiday season for children in military families. Without our support, some of these children would not receive a gift due to the financial hardships placed on their families as a result of their service to our country’s military. Many of these children have parents who have been killed, wounded or severely incapacitated in combat. Giving these children toys won’t bring their parents back or takeaway their injuries, but it will help in giving them a smile and letting them know that they are loved. Thanks to your generosity, we were able to collect over 50 toys for these children. 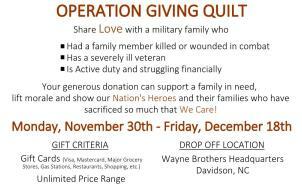 The second one, OPERATION GIVING QUILT, is dedicated to providing financial assistance to struggling military families during the holiday season. The means of providing assistance to these families is by purchasing gift cards, which they can use to purchase items for their families. 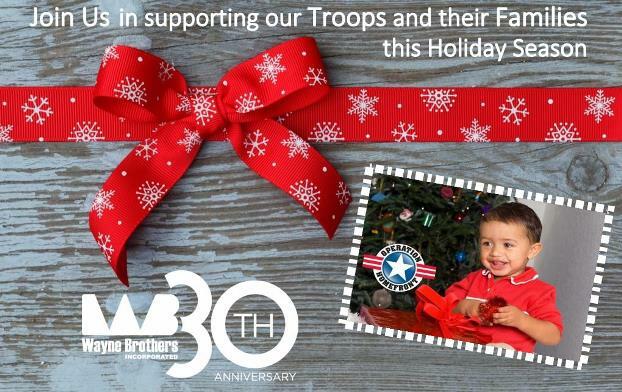 Wayne Brothers employees donated over $600 in gift cards to help brighten the holidays for our military families. Thank you for your support! Wayne Brothers had a great time at the 19th Annual Monica Kreber Golf Tournament at Seabrook Island benefiting Pediatric Cancer Research at MUSC Children’s Hospital. From left to right: Jay Norman with Whiting-Turner, Mark Muller with Wayne Brothers, David Lindstrom with Whiting-Turner, and Wilson Taylor with Ford’s Redi Mix Concrete. This past winter, WB employees donated to our Holiday Giving Back Program. Employees suggested fellow co-workers or folks in the community they knew had special needs during this time of year. Employees donated money and WB matched the contributions. The company also added an additional contribution to the fund and all was distributed prior to the holidays. A total of $10,500 was distributed among five employees and four families from our community. One recipient’s husband passed away last year and left many doctor bills and medical expenses. She lives in a small trailer that is not underpinned. This causes her heating and electrical expenses to be more than she can afford. She struggles to make ends meet and does not have any family to help her. She received a check from WB’s Christmas Giving to purchase materials for the underpinning of her home, and a local church covered the installation. She wanted to make sure everyone at WB knew she was very thankful. After she was given the check she said “Now I won’t have to be cold anymore.” All recipients were very thankful and everyone felt a sense of pride in knowing WB care about their employees and the community in which we live and work! Recently, Wayne Brothers was made aware of an issue that a local high school (Northwest Cabarrus) track team was facing. The school had their track resurfaced and a concrete pad and pit poured for their pole vaulting runway this past off season. It was discovered a few weeks ago that the pit cast in the pole vaulting pad was incorrectly installed (it was out of square with the run way, it was 2.5″ too shallow and the angles on the sides were incorrect). The team’s track season started two weeks ago and they had not been able to practice pole vaulting as a result of the issue with the pit. My wife (who is an assistant track coach there) asked if we had any ideas on how to repair the issue. This is where Scott, Rodney and Moises come in. The three of them took opportunity of a slow day for the finishers and went out to the track field to make the repairs for the team. It didn’t cost us a lot of time or money, but the impact that it made is huge. Now the high school students can carry on with their pole vaulting practice, which will hopefully give them more opportunity to be successful this track season. 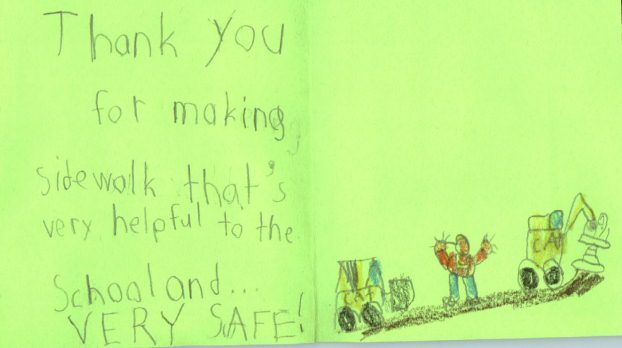 This is just another example of how we can use our skills and resources to make a positive impact on our community. On Friday August 22nd, Andy Johnson, Caleb Skinner, Eddie Cheeks, Chad Johnson and John Ashworth worked to assist Andy with his Eagle Scout Project at NF Woods Advanced Technology and Arts Center in Mooresville, NC. Andy is the son of WB Truck Driver, Chad Johnson. Andy has been involved with Boy Scouts from an early age and set the goal of becoming an Eagle Scout very early in his Scouting experience. Eagle is the highest rank that can be earned by a Scout and Andy is well on his way to completing the requirements. 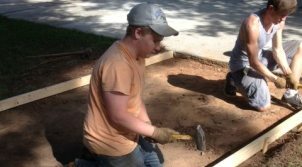 His project at NF Woods Technology Center was to improve the courtyard by adding 3 concrete pads with new picnic tables and adding some pine needle mulch to the existing trees. 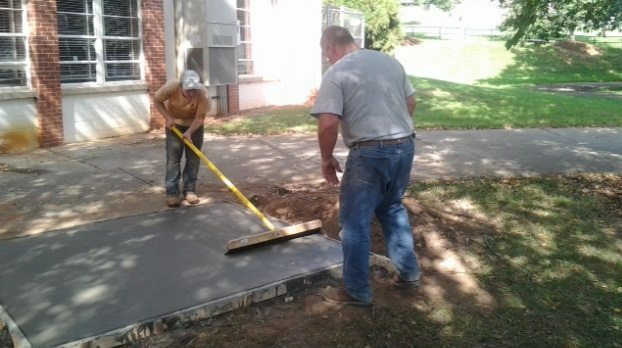 The new concrete pads allow the picnic tables to be accessible by the handicapped. Andy dedicated this improvement to the Memory of James Sneed, his shop teacher at NF Woods. Several of WB vendors offered support to the project. Concrete Supply donated 3 yards of concrete and United Rentals supplied a Georgia Buggy and new finishing broom. 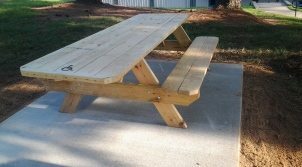 Lowes donated picnic tables and hardware to support the project. Special thanks to Caleb Skinner, Eddie Cheeks, John Ashworth and Chad Johnson for their support of the project. 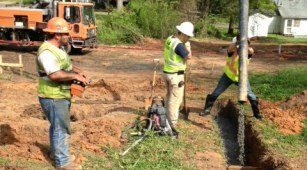 Wayne Brothers was recently involved with a community project in Goose Creek, South Carolina. 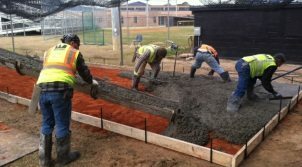 The project included pouring a concrete pad for the Goose Creek High School Baseball Team’s batting cage. 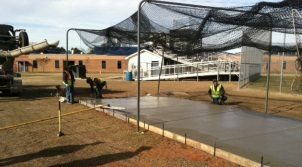 A Charleston based concrete company donated the concrete ready mix, several members of the Berkeley County School District completed the formwork and existing pad demolition, and Wayne Brothers poured, placed and finished the concrete pad. Jamey Sillanpaa, WB’s Superintendent who oversaw the project, graduated from Goose Creek High School. Jamey’s son, Christian, currently plays on their baseball team. 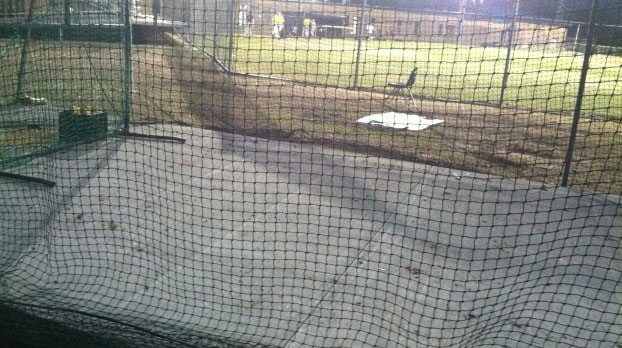 The batting cage turned out great and Wayne Brothers was happy to help the Goose Creek community. 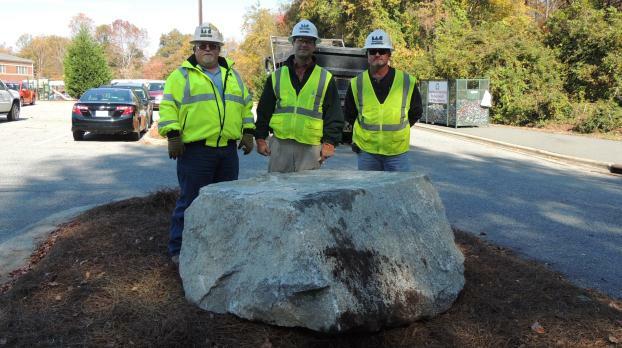 WB Delivers New Spirit Rock for Parkview Elementary School! 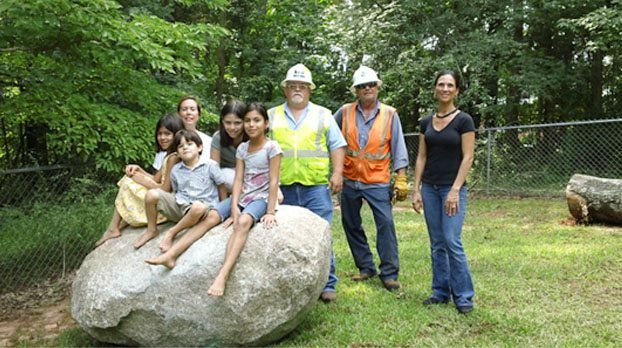 Wayne Brothers and Vulcan Materials teamed up again to deliver a new spirit rock for Park View Elementary School in Mooresville, NC. The 6,500 ton boulder, donated by Vulcan, was hauled and set in place by Wayne Brothers’ Equipment Group. 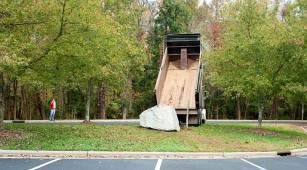 Additionally, they relocated an existing spirit rock to a new location. 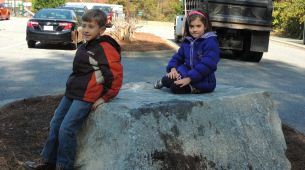 Now the school has a spirit rock for the Kindergarten & First Grader’s and a spirit rock for the Second & Third Grader’s. Helping deliver and place the boulder was WBI’s Shannon Sapp, Todd Wilson and Michael Henrickson (a Park View Elementary alumnus). A big ‘Thank you’ goes to Vulcan’s Denise Hallett and David Holsinger for all their help. 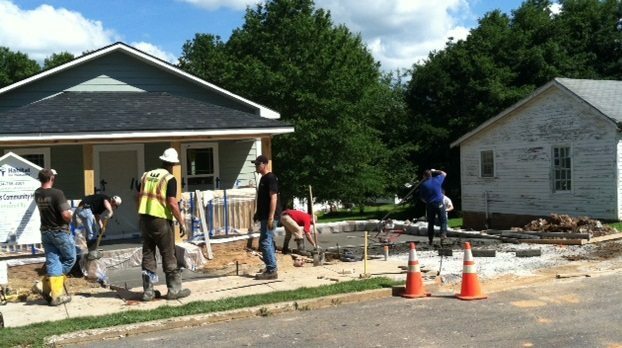 Wayne Brothers employees recently volunteered their time to working on a house for the Habitat for Humanity. 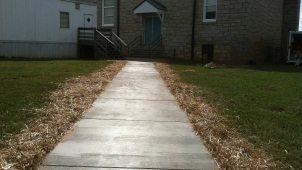 The work included demolition of curb and sidewalk, fine grading and pouring concrete at the front porch, sidewalk and driveway. Thank you very much to William Mitchell, Ryan Barker, Jim Forbes, Isaiah Wayne, Scott Ashworth, John Vaughan, Andrew Love, and Daniel Wayne! Your volunteering has gone towards a great cause- helping create a home for someone that otherwise might not have one. 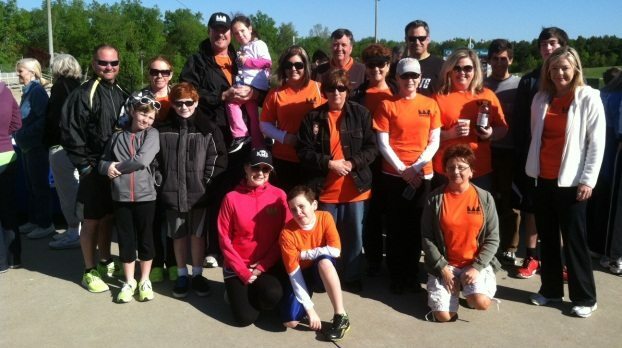 The WB team started off Saturday morning with a brisk walk and fellowship to support the Cabarrus County Annual Walk to Cure Diabetes. Everyone that participated not only enjoyed the walk but also felt a sense of pride in knowing they were helping raise awareness for this disease. They were also proud to be a part of a company that cares enough to participate in this event. Thanks to all that participated! 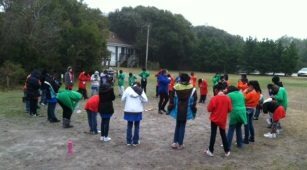 WB Helps Local 4th Grade Class Travel to the Outer Banks! Wayne Brothers donated to the Allenbrook Elementary School’s 4th grade class to assist with their field trip expenses. 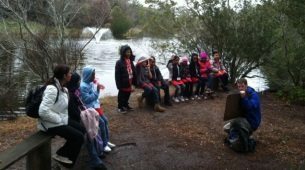 From February 13-15 the class traveled to the Trinity Sound Sea Environmental Educational Program located on the Bogue Sound in the Outer Banks of North Carolina. 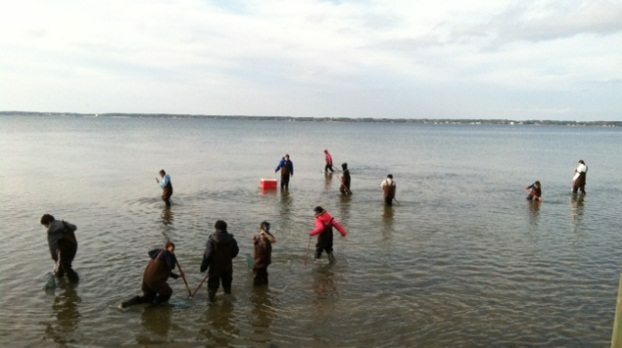 The program offered a residential school program in an outdoor, coastal environment. 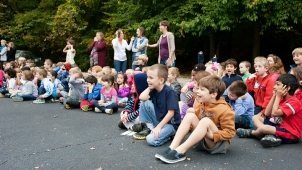 The children participated in a variety of outdoor classes dealing with topics including ocean and salt marsh life, forest and pond ecology, bird and mammal study, and sensory awareness. In addition, Sound and Sea offers a social learning experience in which the children learned to live and work in a close community atmosphere. All major subject areas were covered including science, social studies, math, and language arts. On behalf of myself, my son, and Allenbrook Elementary School, thank you for your contribution towards their field trip. It was a great and valuable experience for everyone. WB & Vulcan Help the Corvian Community School! 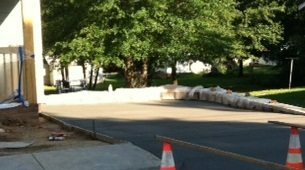 Wayne Brothers teamed up with Vulcan Materials to donate and install a huge boulder for the Corvian Community School in Charlotte, NC. 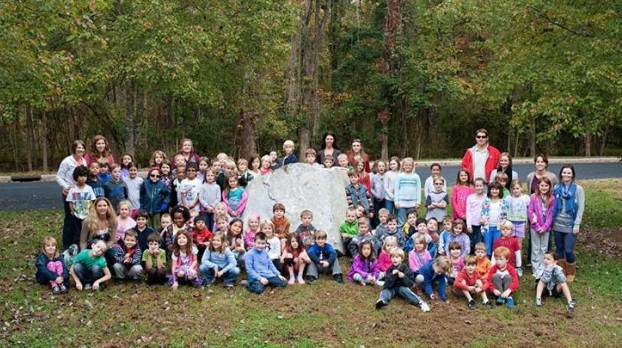 Vulcan donated the boulder, and Wayne Brothers hauled the boulder from the quarry and placed it at the school while the students watched with excitement. 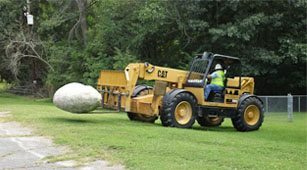 The boulder will be used as a great spirit rock for the students to paint and decorate for special events. Great job, WB & Vulcan! Bob Cartner with Chandler Concrete approached Wayne Brothers about teaming up for the United Way’s Rowan County 2012 Day of Caring. 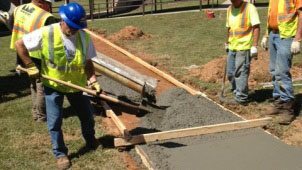 When he told us the project was in our local community, to build brand new concrete sidewalks for the Enochville Elementary school in Kannapolis, North Carolina, we knew we had to participate! The project consisted of prep, place and finish of new sidewalk, plus three areas of existing sidewalk needed to be removed and replaced. The concrete in these areas had buckled due to tree roots growing under the sidewalk, and it was creating a tripping hazard for the children and teachers. John Ashworth, WB’s VP of Field Operations, organized this project for Wayne Brothers. He was appreciative of the great response he received when he asked several of WB’s Superintendents, including several that live in the local community, if they were willing to participate. Several of our employees, including Jason Loucks and Daniel Mancera, have children that attend Enochville Elementary School. This project came together with the help of John Ashworth, Josh Akers, Jason Loucks, Daniel Mancera, Jesse Green, Scott Ashworth, Kevin Steele, Rick McCracken, Bob Cartner, WBI’s Equipment Group, Chandler Concrete, and the United Way. 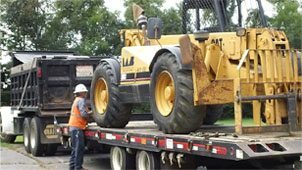 WB’s Equipment Group delivered the skid steer and mini excavator for the project. Chandler Concrete donated the concrete for the project. Josh, Jason, Daniel and Jesse performed the prep work which included stripping the topsoil from the new side walk area, forming the sidewalk, and removing the existing damaged sidewalks. Then they all worked together to place and finish the sidewalks. It took a group effort to complete the project, and now Enochville Elementary’s sidewalks look great! The children and teachers are very excited and appreciative to have new, safe sidewalks at their school, and Wayne Brothers was happy to donate their time and energy to help their local schools. WB Helps the Davidson Montessori School! Thanks to the efforts of Wayne Brothers and Vulcan Materials, we were able to help the Davidson Montessori School with their new playground! 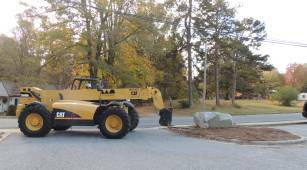 Vulcan donated two boulders and three tons of #57 stone, and WB’s employees, Alan, Todd and Nelson, coordinated, delivered and placed the materials. WB’s Asset Manager, Alan Goodman, receives the ALL-IN Award at the Cabarrus Chamber of Commerce Annual Awards Ceremony! 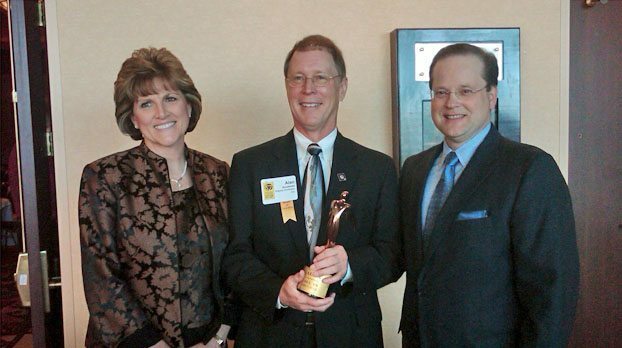 Alan received this award for his excellent leadership and guidance of the Chamber’s Executive Committee. Great job, Alan! 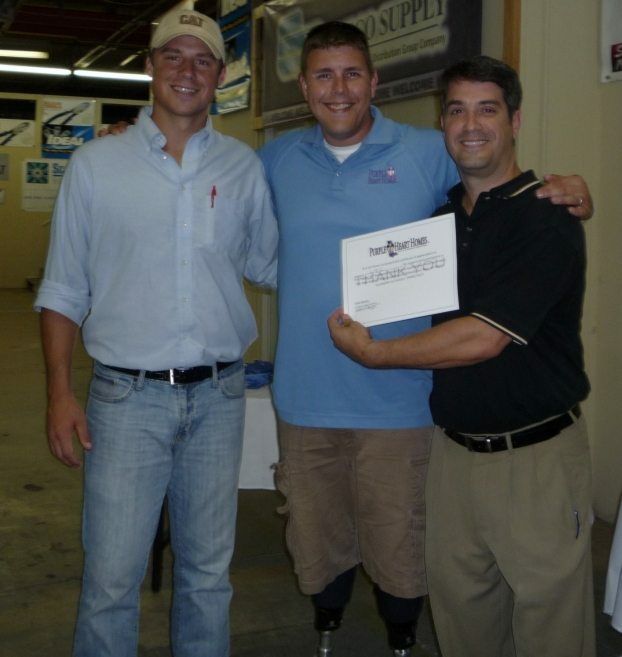 WB and the ABC helped Injured Veterans through the Purple Heart Homes After being wounded in Iraq, Statesville buddies Dale Beatty and John Gallina devoted themselves to helping other injured vets. They formed Purple Heart Homes, a nonprofit that builds houses and adds handicapped-accessible features to existing homes of veterans. The organization also is working to provide foreclosed homes to veterans in need.